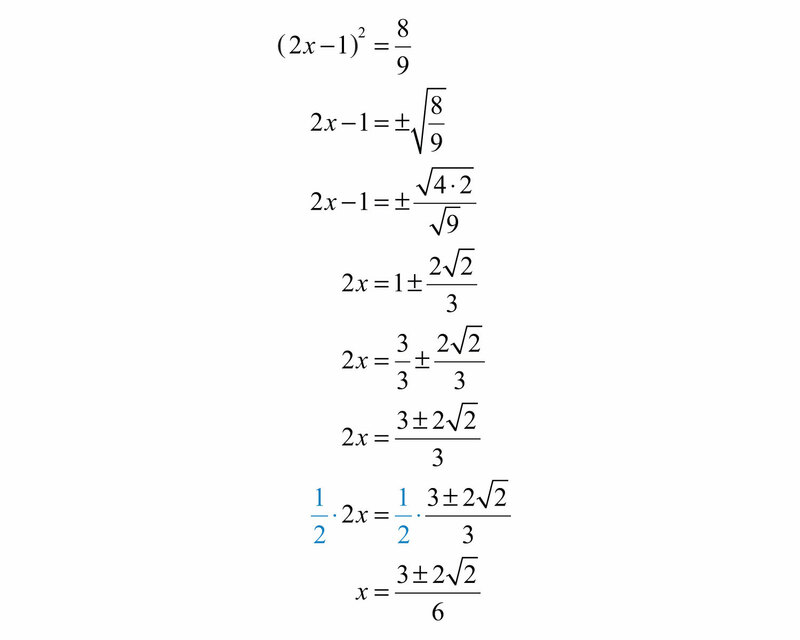 This is “Extracting Square Roots”, section 9.1 from the book Beginning Algebra (v. 1.0). For details on it (including licensing), click here. Solve quadratic equations by extracting square roots. Step 1: Express the quadratic equation in standard form. Step 2: Factor the quadratic expression. Step 3: Apply the zero-product property and set each variable factor equal to 0. Step 4: Solve the resulting linear equations. The equation x2−4=0 is in this form and can be solved by first isolating x2. The notation “±” is read “plus or minus” and is used as compact notation that indicates two solutions. Hence the statement x=±k indicates that x=−k or x=k. Applying the square root property as a means of solving a quadratic equation is called extracting the rootsApplying the square root property as a means of solving a quadratic equation.. Solution: Begin by isolating the square. Next, apply the square root property. Answer: The solutions are −5 and 5. The check is left to the reader. Certainly, the previous example could have been solved just as easily by factoring. However, it demonstrates a technique that can be used to solve equations in this form that do not factor. Solution: Notice that the quadratic expression on the left does not factor. We can extract the roots if we first isolate the leading term, x2. Apply the square root property. For completeness, check that these two real solutions solve the original quadratic equation. Generally, the check is optional. Answer: The solutions are −5 and 5. Solution: Begin by isolating x2. Apply the square root property and then simplify. Answer: The solutions are −352 and 352. Sometimes quadratic equations have no real solution. After applying the square root property, we are left with the square root of a negative number. Therefore, there is no real solution to this equation. Reverse this process to find equations with given solutions of the form ±k. Example 5: Find an equation with solutions −23 and 23. Lastly, subtract 12 from both sides and present the equation in standard form. To solve this equation by factoring, first square x+2 and then put it in standard form, equal to zero, by subtracting 25 from both sides. Factor and then apply the zero-product property. The two solutions are −7 and 3. When an equation is in this form, we can obtain the solutions in fewer steps by extracting the roots. Solution: Solve by extracting the roots. At this point, separate the “plus or minus” into two equations and simplify each individually. Answer: The solutions are −7 and 3. In addition to fewer steps, this method allows us to solve equations that do not factor. Next, extract the roots and simplify. Answer: The solutions are −1−3 and −1+3. Solution: Begin by isolating the square factor. Apply the square root property and solve. Answer: The solutions are 3−226 and 3+226. Example 9: The length of a rectangle is twice its width. If the diagonal measures 2 feet, then find the dimensions of the rectangle. Here we obtain two solutions, w=−25 and w=25. Since the problem asked for a length of a rectangle, we disregard the negative answer. Furthermore, we will rationalize the denominator and present our solutions without any radicals in the denominator. Back substitute to find the length. Answer: The length of the rectangle is 455 feet and the width is 255 feet. Solve equations of the form ax2+c=0 by extracting the roots. Extracting roots involves isolating the square and then applying the square root property. After applying the square root property, you have two linear equations that each can be solved. Be sure to simplify all radical expressions and rationalize the denominator if necessary. Solve by factoring and then solve by extracting roots. Check answers. 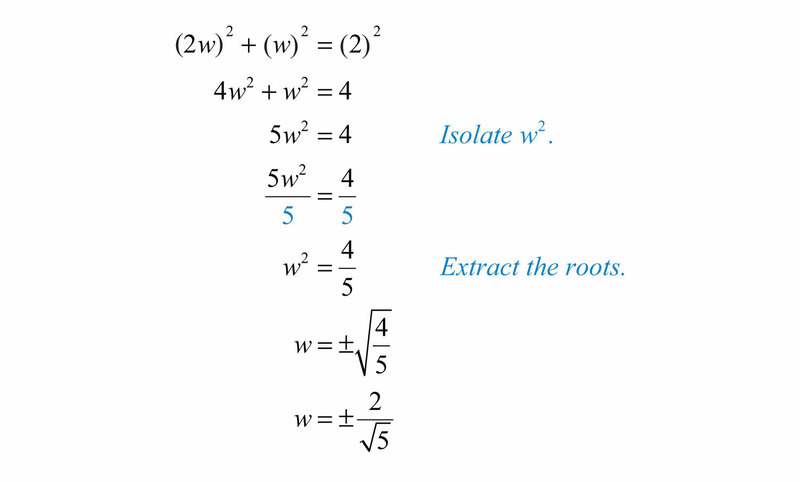 Solve by extracting the roots. Find a quadratic equation in standard form with the following solutions. Solve and round off the solutions to the nearest hundredth. Set up an algebraic equation and use it to solve the following. 79. If 9 is subtracted from 4 times the square of a number, then the result is 3. Find the number. 80. If 20 is subtracted from the square of a number, then the result is 4. Find the number. 81. If 1 is added to 3 times the square of a number, then the result is 2. Find the number. 82. If 3 is added to 2 times the square of a number, then the result is 12. Find the number. 83. If a square has an area of 8 square centimeters, then find the length of each side. 84. If a circle has an area of 32π square centimeters, then find the length of the radius. 87. The length of a rectangle is 6 times its width. If the area is 96 square inches, then find the dimensions of the rectangle. 88. The base of a triangle is twice its height. If the area is 16 square centimeters, then find the length of its base. 89. A square has an area of 36 square units. By what equal amount will the sides have to be increased to create a square with double the given area? 90. A circle has an area of 25π square units. By what amount will the radius have to be increased to create a circle with double the given area? 91. If the sides of a square measure 1 unit, then find the length of the diagonal. 92. If the sides of a square measure 2 units, then find the length of the diagonal. 93. The diagonal of a square measures 5 inches. Find the length of each side. 94. The diagonal of a square measures 3 inches. Find the length of each side. 95. The length of a rectangle is twice its width. If the diagonal measures 10 feet, then find the dimensions of the rectangle. 96. The length of a rectangle is twice its width. If the diagonal measures 8 feet, then find the dimensions of the rectangle. 97. The length of a rectangle is 3 times its width. If the diagonal measures 5 meters, then find the dimensions of the rectangle. 98. The length of a rectangle is 3 times its width. If the diagonal measures 2 feet, then find the dimensions of the rectangle. 100. The height in feet of an object dropped from a 20‑foot platform is given by h(t)=−16t2+20, where t represents the time in seconds after the object has been dropped. How long does it take the object to hit the ground? 101. The height in feet of an object dropped from the top of a 144-foot building is given by h(t)=−16t2+144, where t is measured in seconds. a. How long will it take to reach half of the distance to the ground, 72 feet? b. How long will it take to travel the rest of the distance to the ground? Round off to the nearest hundredth of a second. 102. The height in feet of an object dropped from an airplane at 1,600 feet is given by h(t)=−16t2+1,600, where t is in seconds. a. How long will it take to reach half of the distance to the ground? 103. Create an equation of your own that can be solved by extracting the root. Share it, along with the solution, on the discussion board. 104. Explain why the technique of extracting roots greatly expands our ability to solve quadratic equations. 105. Explain in your own words how to solve by extracting the roots. 106. Derive a formula for the diagonal of a square in terms of its sides.